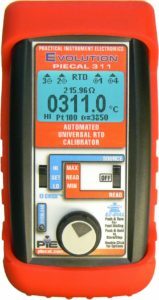 Altek 311 RTD calibrator – no longer in production! The Altek 311 was designed back in 1998 and was last manufactured in 2015. The PIE 311 matches the Altek in fit, form and function with a few features bringing the design into the 21st century. PIE guarantees compatibility with both classic and modern RTD process instruments. The Altek 311, as well as other older calibrators, are not able to calibrate newer instruments such as smart transmitters, multichannel recorders, and PLC RTD inputs. The PIE 311 has a rubber boot and lower profile switches for protection in the field and a backlit display making it easier to use in the dark corners of your plant. Instead of the six “AA” batteries in the Altek the PIE uses four “AA” batteries. The PIE has the same resolution and accuracy as the Altek with longer battery life letting you calibrate more instruments between battery changes. Works with Rosemount & Honeywell Smart Transmitters, PLCs, DCSs, Multi-channel Recorders and other pulsed excitation devices. Higher accuracy at low excitation curents. Looking for more than just an Altek 311 replacement? 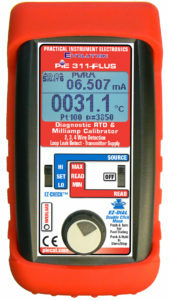 The PIE 311Plus Diagnostic RTD & milliamp calibrator offer you not only a high accuracy temperature calibrator but also a milliamp calibrator that can source and read up to 24mA, simulate 2-Wire transmitters and also power and measure your 24V transmitters or other control instrumentation. Similar to our PIE 334Plus, the 311Plus calibrator includes our Patented (US # 7,248,058) Current Leak Detection which protects not only your instrumentation and property from potentially catastrophic failure, but also helps ensure the safety of your most valuable assets – your people! With our Current leak detection, you can detect excess loop current due to issues such as moisture, corrosion and ground faults that can cause potentially dangerous situations. Why choose a PIE 311 instead of some other brand of RTD calibrator? 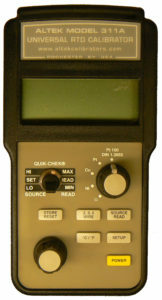 Like the Altek, the PIE 311 works with many different types of RTDs. We are the same team that designed the Altek 311 and 311A and no other manufacturer has as much RTD calibrator experience as PIE. In addition to RTD calibrators also manufactures a complete line of milliamp, voltage, thermocouple, and frequency single function calibrators as well as multifunction calibrators matching and surpassing the Altek line of handheld calibrators. When it is time for service on your Altek RTD calibrator PIE has the most experience in calibration and repair of Altek electronic calibrators. Or, if it is time to upgrade or replace a failing Altek 311 calibrator, we offer a discount on a new PIE calibrator similar to the Altek that you are replacing – in working or non working condition! Click for repair and calibration pricing.